Can Libra men and Cancer women relationships be compatible mentally, emotionally and sexually? The future for a Libra Man Cancer Woman in love does not look good. It will be hard for a Libra Man to get along with a Cancer Woman when they have so many differences, including the way they look at the world. It is probably best if he doesn’t even try to make a connection with her because they will both end up being very upset. The Cancer Woman is an interesting creature. She often lives within her shell and can be considered almost mysterious. This might intrigue the Libra Man who is intellectual and likes to discover new things. But honestly he doesn’t have the time nor patience to figure out a Cancer Woman. The only thing she could bring to a Libra Man and Cancer Woman relationship is financial stability. The Cancer female is great at making and saving money and always has a lucky side to her. Though as soon as she reviews the monthly bank statement, she will become very frustrated with her Libran mate who likes to spend a lot of money. The Cancer Woman lives through her emotions and is a very sentimental person. She has a tendency to have strong mood swings but has trouble expressing her emotions with others. Just like a crab, she often has a hard shell around her that makes it difficult for anyone to get close to her. The Libra Male is very analytical and has a diplomatic side to him so he might be able to deal with the constantly changing emotions of a Cancer Woman. But it won’t be unlikely that he will soon run out of patience or not be able to see the sign of her bad mood until it is too late ad lead to a breakup of the Libra Cancer love match. The Libran is a social butterfly and enjoys being out of the house. He isn’t one for making and saving money because he enjoys spending it on the finer things in life. Libra Men don’t make the best homemakers and will often put off responsibilities till the last moment. Cancer Women are complete opposites. She would rather be at home spending time with the family instead of being with friends at a party. She likes to create harmony and peace in her home setting in order to feel secure and safe. The Cancer Woman will have a hard time dealing with a partner who is never home, is horrible at finances, and isn’t one to tidy up after himself. More than likely she will soon become jealous of the Libra Man who is always off to another party and has the tendency to be a wicked flirt. The main thing that will get on the nerves of the Libra Man is the Cancer Woman’s inability to have clear ideas. His intelligent side allows him to be more precise which helps him be more diplomatic. But he will often be stressed out by her lack of good communication and his tendency to be indecisive. The Libra and Cancer in bed will not be compatible sexually, as they have different definitions of love compatibility in this relationship and can never become soulmates. Libra is an air sign that is cardinal and is Cancer a water sign that is cardinal by nature. 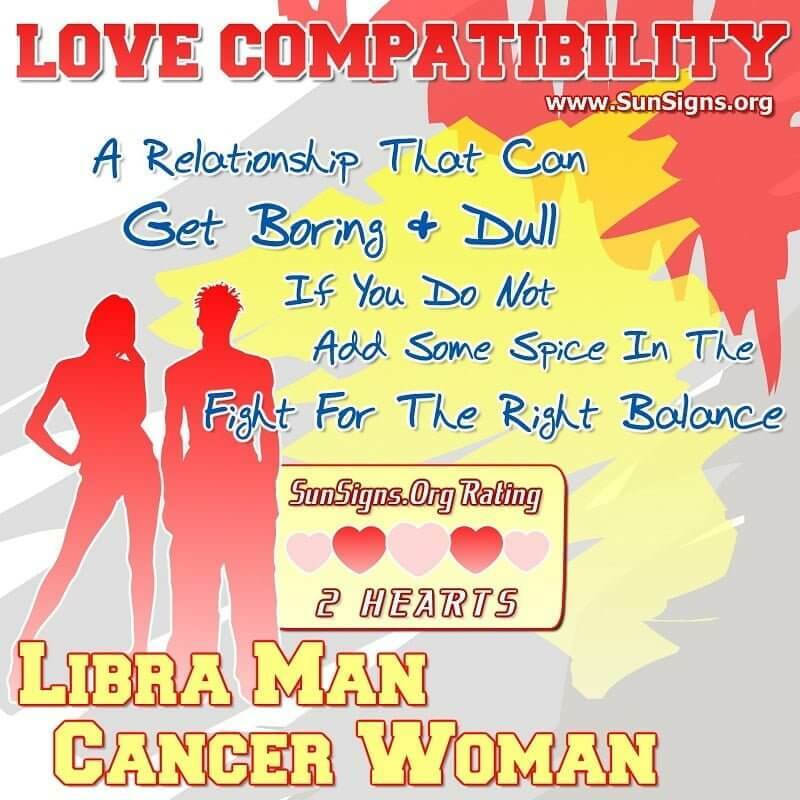 The Libra man Cancer woman compatibility gets a TWO Hearts love rating. It is hard to picture a Libra Man dating a Cancer Woman as they live in two opposite worlds. Maybe at a Libra Man friend’s birthday party who is related to the Cancer Woman? There is very little foundation for a happy Libra Man Cancer Woman marriage, let alone a friendship. In any case this is better avoided if you want to keep both of these zodiac signs happy. The intellectual Libra Man should have the common sense to stay away from the ocean of emotions that the Cancer Woman carries.